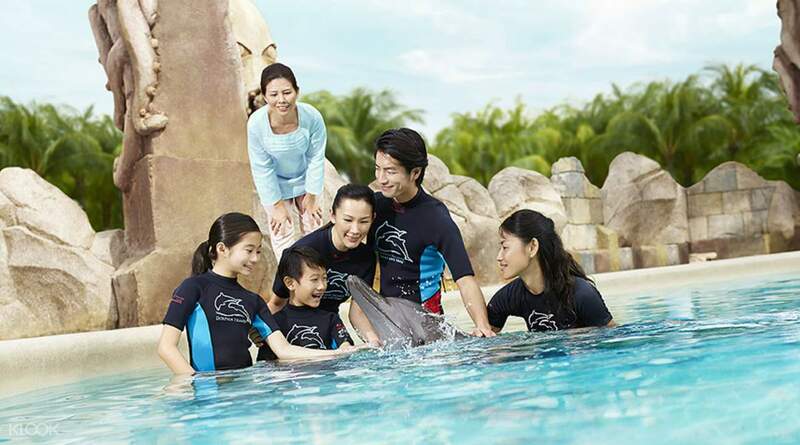 Play and swim with dolphins at Sentosa! Me and my wife had a wonderful time doing this together. Would recommend to any one that is interested in doing this activity. It is a time to remember. Get US$2.0 back in Klook credits for your next trip when you book this activity! Complete this Klook activity to get 5% of the activity cost back in free credits to use on your next booking. For example, book US$40.55 to get US$2.0 free credits. Tick another thing off the bucket list with the chance to actually swim with dolphins in Singapore. You'll be wading waist-deep into the water to meet Indo-Pacific bottlenose dolphins up close! 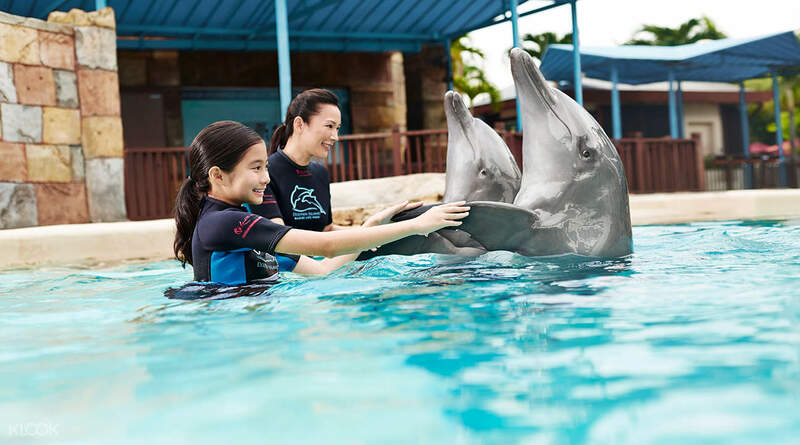 In Dolphin Discovery, you'll get the chance to personally interact with the beautiful marine creatures and play with them at their Resorts World Sentosa home. 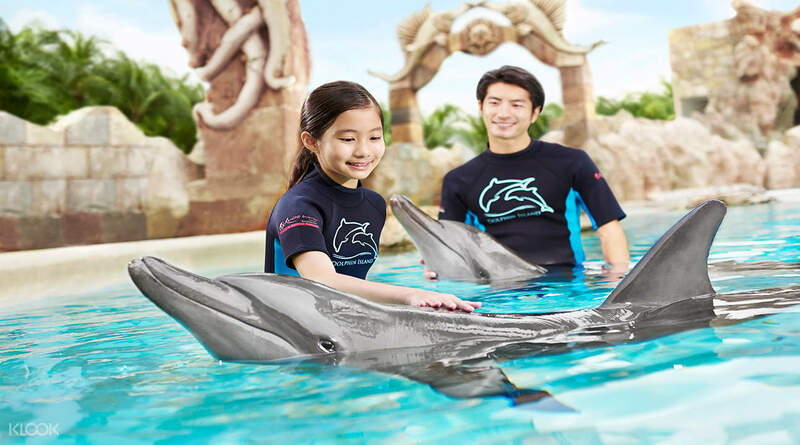 In the Dolphin Adventure, you'll also be able to swim alongside them and be propelled through the water by them! The sneakers will also tell you more about their habitats, diet, and the threats they face in their day-to-day ocean life. Couple this with learning games, hand signals, and fun facts about the dolphins, and there you have it: the most interesting marine crash course ever! This is my favorite adventure. We had so much fun with Sihat. I would highly recommend families to experience this rare opportunity to interact with the dolphins. The trainers were so great. Thanks Klook for making this possible and convenient. There was no queue. This is my favorite adventure. We had so much fun with Sihat. I would highly recommend families to experience this rare opportunity to interact with the dolphins. The trainers were so great. Thanks Klook for making this possible and convenient. There was no queue. Fantastic experience with amazing creatures! They are so clever and friendly. One of the best attractions ever! Only backside is the price for photos (expensive). Fantastic experience with amazing creatures! They are so clever and friendly. One of the best attractions ever! Only backside is the price for photos (expensive). Wonderful time full of everlasting memories. It would have been nice if the photographer had taken a video. Wonderful time full of everlasting memories. It would have been nice if the photographer had taken a video. The redemption of ticket is so easy. The activity is superb. Enjoyed a lot while interacting with dolphins. The photos are too expensive, they are charging 200$ for 75 photos. The redemption of ticket is so easy. The activity is superb. Enjoyed a lot while interacting with dolphins. The photos are too expensive, they are charging 200$ for 75 photos. Amazing experice.....must do.......perfect for kids and the instructors are very good.....they expalin in both Chinese and English. Amazing experice.....must do.......perfect for kids and the instructors are very good.....they expalin in both Chinese and English. Me and my wife had a wonderful time doing this together. Would recommend to any one that is interested in doing this activity. It is a time to remember. Me and my wife had a wonderful time doing this together. Would recommend to any one that is interested in doing this activity. It is a time to remember. I dont know of any other place where you can experience dolphins this close and personal. To share a cuddle and a kiss is something very special and to see their intelligence and playfulness up close and personal is very memorable. Small groups make this very ideal, trainers very knowledgeable. Photos are very expensive but we paid as it's an experience we want to always look back at fondly. Highly recommended. I dont know of any other place where you can experience dolphins this close and personal. To share a cuddle and a kiss is something very special and to see their intelligence and playfulness up close and personal is very memorable. Small groups make this very ideal, trainers very knowledgeable. Photos are very expensive but we paid as it's an experience we want to always look back at fondly. Highly recommended. It is a great program and worth going! You can interactive with dolphins, play and dance with them, take pictures with them and also kiss them! The photo packages were a bit expensive though (no cameras allowed inside)! It is a great program and worth going! You can interactive with dolphins, play and dance with them, take pictures with them and also kiss them! The photo packages were a bit expensive though (no cameras allowed inside)! You can get to Universal by Sentosa Experess and walk to Adventure Cove Park. Remember to bring a long passport of participants. The Dolphin Discovery was great but kinda short in time. Remember to bring along at least $200 for the photos. You can get to Universal by Sentosa Experess and walk to Adventure Cove Park. Remember to bring a long passport of participants. The Dolphin Discovery was great but kinda short in time. Remember to bring along at least $200 for the photos. My family had much fun. Very special experience, a must try activities, take about 30mins. Photo SGD60/each, cheapest package only SGD200 (online copy download, up to 75 pics + 2 printed photo). Remember bring passport when redeem ticket. Very nice, will come back soon. 5 stars. My family had much fun. Very special experience, a must try activities, take about 30mins. Photo SGD60/each, cheapest package only SGD200 (online copy download, up to 75 pics + 2 printed photo). Remember bring passport when redeem ticket. Very nice, will come back soon. 5 stars. Q: I booked the Dolphin Island Interaction for several people. How come the voucher only displays a few names? A: The names shown on the vouchers are only the Lead Travelers who have to be presented to collect the tickets. As long as the number of participants are correct, everyone will be able to participate in the activity.